In J. P. Vilas-Boas, F. Alves, A. Marques (Eds. ), Biomechanics and Medicine in Swimming X. Portuguese Journal of Sport Sciences, 6(Suppl. 2), 218-220. In competitive swim programs, training distance is often given priority at the expense of technique instruction. The lack of emphasis on technique may be related to a misperception about the potential impact on performance. 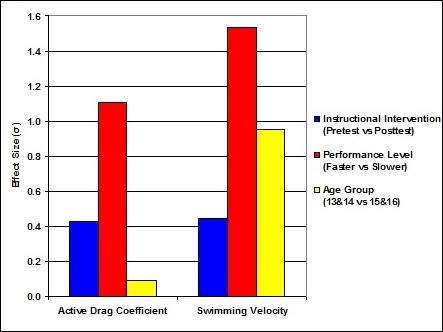 The purpose of this study was to determine the magnitude of the effect of an instructional intervention on technique (as measured by the active drag coefficient, Cd) and performance (swimming velocity, SV). The subjects were 18 competitive swimmers (12 males and 6 females) between the ages of 12 and 15. They were pretested with Aquanex+Video. The instrumentation and testing protocol were previously described and validated. After the pretest, a one-week intervention included three classroom and five poolside instructional sessions. The treatment included technique feedback with specific visual and kinesthetic cues designed to improve the Cd and SV. The subjects were then posttested. There was an overall significant improvement in both Cd and SV. The Cd decreased by .31? (p<.05) and the SV increased by .26? (p<.05). A one-week instructional intervention significantly improved both technique and performance. The magnitude of the effect compares favorably with differences previously found between faster and slower performance levels in Cd (.46?) and SV (.65?). The results demonstrate that even a relatively short duration of carefully targeted instruction can make a meaningful improvement in technique and performance and will hopefully encourage coaches to reconsider training time allocation. Click to go to the full presentation.